Make your own custom waxed papers! 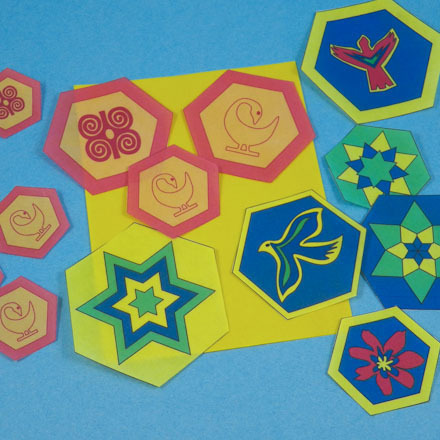 Learn the technique of waxing paper, and in no time you'll be making waxed papers in any colors or designs you like. Waxing paper not only makes the paper water- and oil-resistant, but also adds a degree of translucence, darkens the paper, and changes its feel. After you wax the paper, it will be thicker, stronger, and less absorbent. 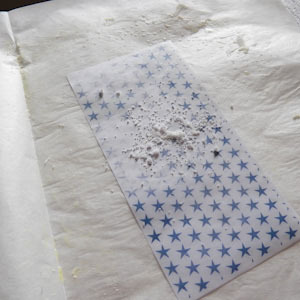 You can use waxed paper in place of vellum in many crafts. It can be used to make bags, paper flowers, delightful charms for gift wrapping, windows clings and stained glass effects. Its translucent nature makes it a natural for luminaries! Waxing paper is for adults or teens only!! Caution: Hot wax and hot iron can burn. Select papers to wax. 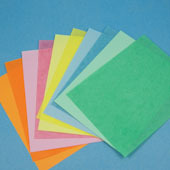 Thin papers work best: computer paper, origami paper, or scrapbooking/craft paper. 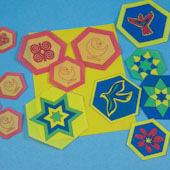 Plain or patterned paper can be used. 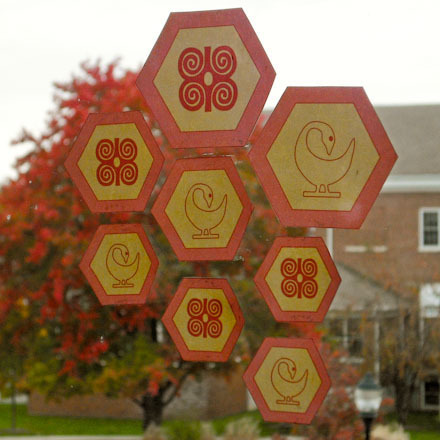 Apply wax to papers that have been printed on an inkjet or laser printer, and the possibilities for designs are endless! 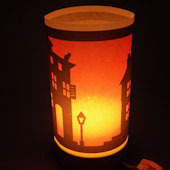 It is particularly fun to upcycle scraps of paper left over from other craft projects by giving them the wax treatment! Or try Aunt Annie's patterns for Paper Charms and Gift Tags or an ePaper download. 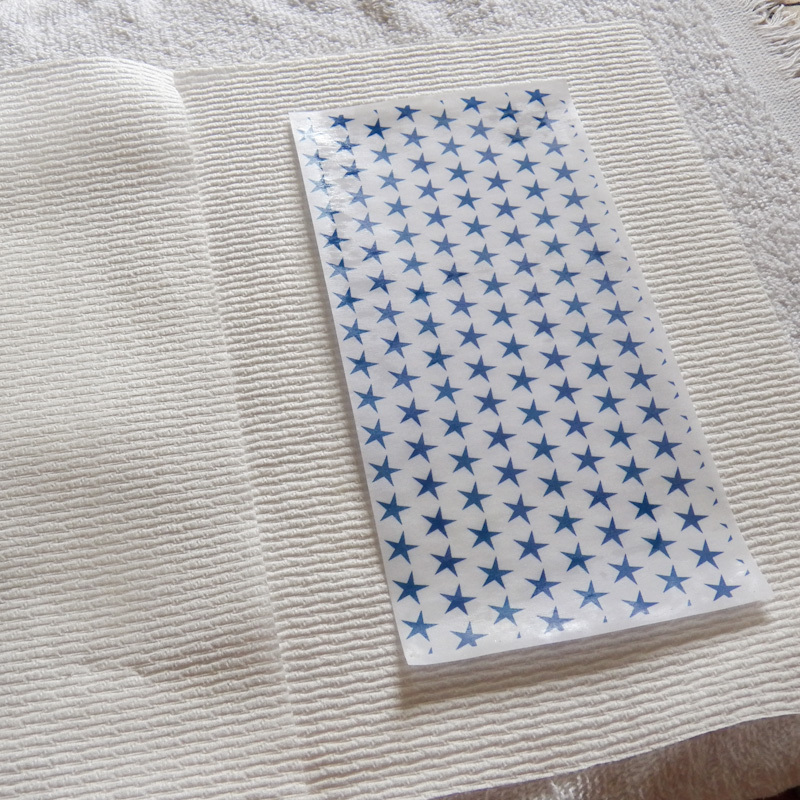 Cut a sheet of parchment paper three to four times the size of the paper you are waxing. Fold the parchment paper in half. Tip: Your paper needs to fit inside the folded parchment with plenty of room to spare. Set your iron to the low setting with no steam. 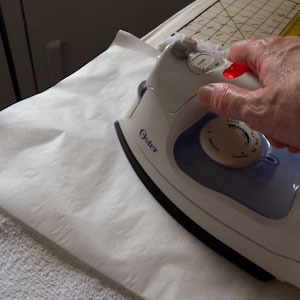 Layout the old towel on top of your ironing board and place the opened parchment paper on top of the towel. Sprinkle a small amount of wax crumbles on the right side of the parchment paper. Fold the parchment paper and run the iron over the back of the parchment to melt the wax. It will only take seconds to melt the wax! 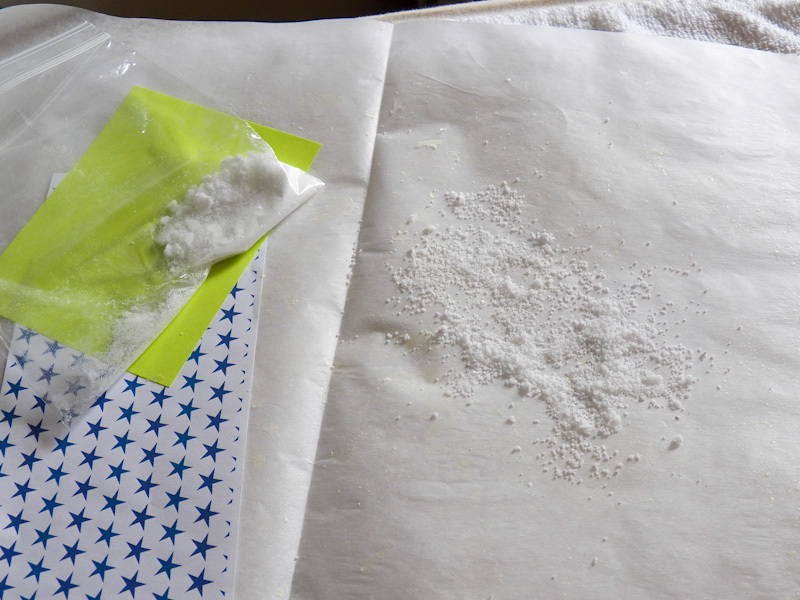 Tip: The wax will spread quickly and can easily run out of the parchment paper. This is why you need a large sheet of parchment and an old towel! 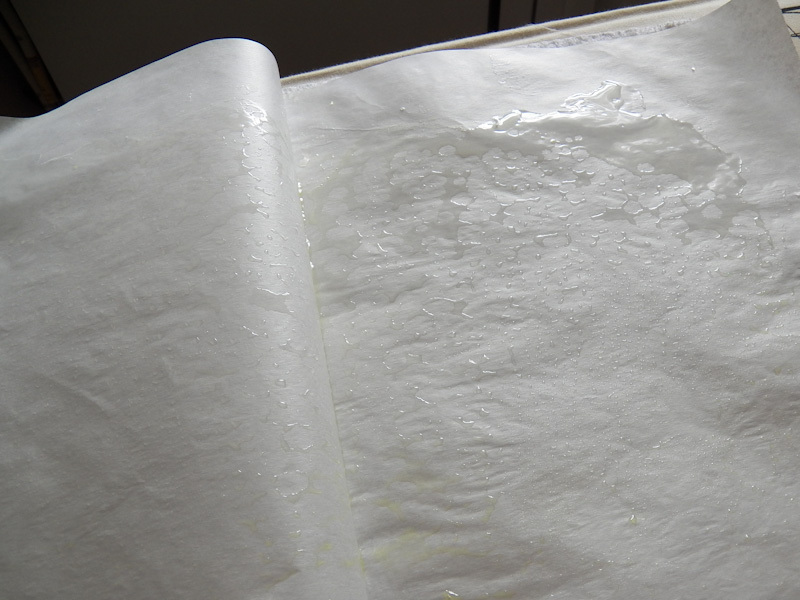 Open the parchment to see if the wax is melted in an area large enough for your paper size. If not, add more wax crumbles and iron again. Place your paper on the melted wax. 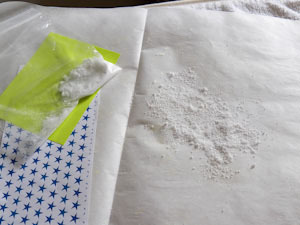 Fold the parchment paper over the paper and iron for a few seconds. 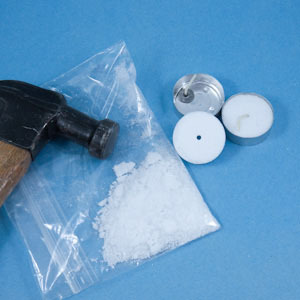 If needed, use the side of the iron to push wax toward the paper. Open the parchment and check the waxed paper for even and complete waxing. If more wax is needed, add a few crumbles of wax and iron again. Place the waxed paper between two sheets of white paper or paper towels. 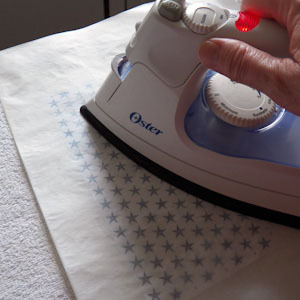 Iron to remove any excess wax or wax clumps. Feel the paper's surface to see if it is smooth. If not, iron it more to remove excess wax. See the sidebar for ideas on using your waxed paper. That's it! Your paper is waxed! Charms punched from waxed paper are unique embellishments! Download and print Aunt Annie's patterns for Paper Charms and Gift Tags (colored and black&white). 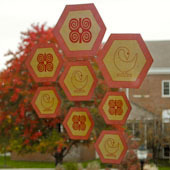 Apply wax, then use the shapes as window clings, gift wrap charms or fancy gift tags. 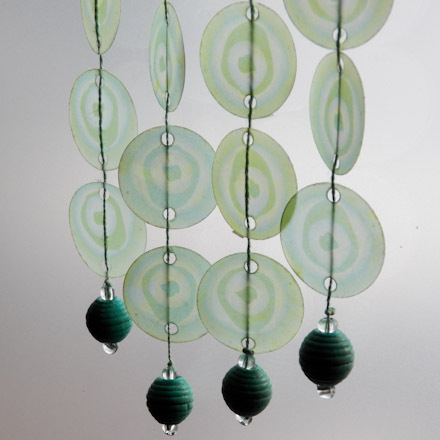 Tip: Use the Green Tranquil Circles ePapers to make translucent waxed paper for crafts. You might punch circles or cut shapes from the paper to make a beaded curtain or to use in your crafts. See more ideas below. 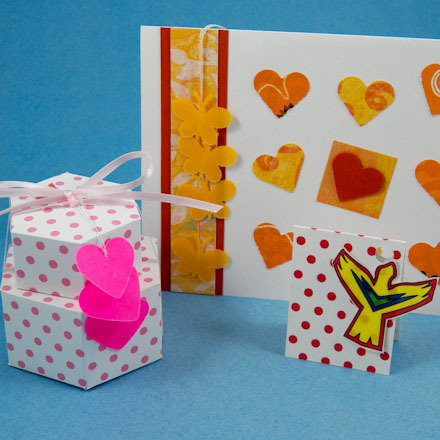 Tip: Punch or cut custom waxed paper in small shapes to make charms for greeting cards, gift tags, or as gift wrap additions. Use a needle and thread to string several charms together. 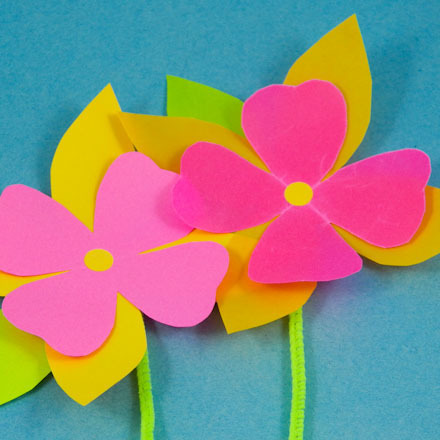 Tip: Make Paper Flowers with handmade waxed paper. Compare the translucent look of the flower made with waxed paper on the right to the plain paper flower on the left. Let Bob show you how to make a Luminaria with a wood base or by using an electric candle. Tip: Make cookie bags from homemade waxed paper. When making waxed paper for food, use paraffin wax in place of candle wax. Tip: Shave the paraffin in small curls with a paring knife. 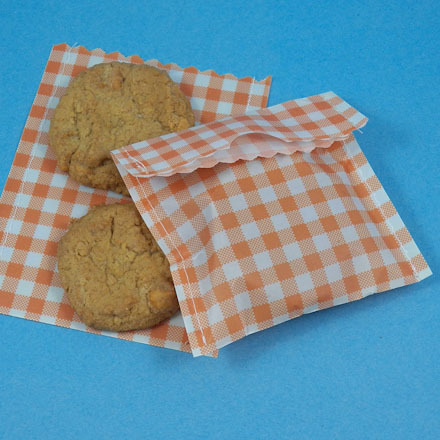 These bags are made by printing Aunt Annie's Orange gingham digital paper on a sheet of white paper and waxing it. The paper is then cut in half lengthwise, folded in half, and stitched on the sides using a long stitch on the sewing machine.